BBA Artist Prize is an annual competition for up-and-coming artists. The shortlisted artists are presented in a group show during Gallery Weekend Berlin. 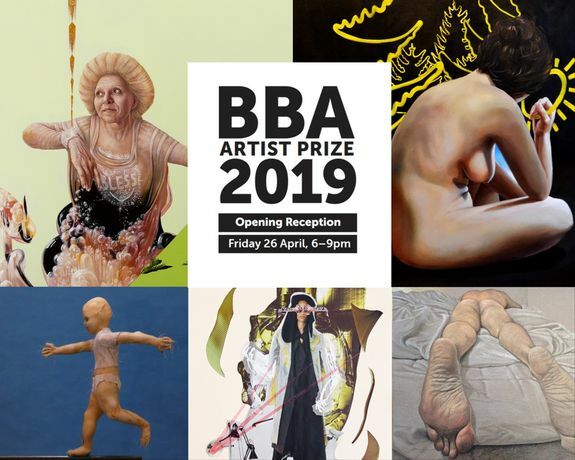 The winner of the BBA Artist Prize receives a Cash Prize and a One-Year-Promotion through the Gallery's Artsy Profile. The portrayals of Tanmaya’s subjects are a direct reflection of her fascination with the human condition. People and animals are often the focal point of her work and act as a beacon of familiarity for the viewer. They are frequently placed within a context that is otherworldly with an oblique or unusual frame of reference. It is through these exaggerated renditions of life that she has cultivated her own style. Even though her artworks appear to have a photographic quality, they are hand drawn and painted. The realistic elements are primarily rendered in colored pencil while the abstracted elements are typically painted with acrylic. In an attempt to visually resolve the opposing and dual urges experienced in love, Tanmaya Bingham has created her seven-panel series ‘Cosmic Garden’, in order to illustrate how the unfamiliar and other worldly cosmos can converge with the familiar and earthly garden. To capture this Tanmaya uses classical poses and attire from 17th and 18th century paintings for her subjects along with iconic athletic logos to reference the corporations in Portland, where she lives. These serene subjects and their animals are primarily placed on suspended thin planes of green ground strewn with stretched shadows and tuffs of vegetation. Surrounding these planes, and often encroaching on them, is the light green sky adorned with abstracted cosmic swirls of color, voids of black, and puffs of twinkly bubbles. Tanmaya studied Visual Arts in Australia and the USA. Her works have been shown in numerous solo- and group exhibitions across Australia and the USA since the early 2000’s and she has been awarded several prices and grants, most recently the Bradley International Print and Drawing Prize 2019. Her works are held in The Elliott Eyes Collection in Sydney. She currently lives and works in Portland, Oregon, USA. Madeleine is a Berlin and Paris based visual artist investigating questions of subject construction. The key elements underpinning her artistic approach include memory, zeitgeist, fashion, authenticity, ego-staging, image, role, social networking, cultural identity, biography, narration, transformation and interaction. Her interdisciplinary engagement embraces and builds on interrelated aspects of art, fashion, design and architecture, as well as visual communication, theatre and film. Her vision: to find a specific dialogue to question some of the challenging topics of our time. Madeleine is the founder of The Psychedelic Chicks, a fictional girls rock band present on various media scenes: Collage, painting, mixed media installations and ephemeral happenings. To compose the band figures the artist uses visual fragments from fashion, advertising and media to transcribe the central influence of the socio-cultural and political context in the construction of identity. She frees The Psychedelic Chicks from their normative postures, giving them gestures-symbols for their re-appropriation as a subject: They play air-guitar, an allegory of a necessary release from old school mindsets and behavior patterns. Her girl band shall be seen as a manifesto of human creativity, curiosity and the courage to break with conventional frames and structures. In an era of rising complexity and radical changes, it is time to dream and hope again. Madeleine received her artistic training under Valérie Favre, EVA & ADELE, Xenia Hausner, Arnulf Rainer and Valie Export. She has been enrolled in Curation studies under Prof. Eugen Blume (Hamburger Bahnhof, Berlin), Dr. Katja Blomberg (Haus am Waldsee, Berlin) and Dirk Luckow (Deichtorhallen, Hamburg), among others at the University of Arts Berlin and has studied Art history at the Freie Universität Berlin. Klara Sedlo’s works are full of symbols and hidden meanings – sun, symbol for hope or light, lakes, symbol for something deep, marshmallows referring to sweetness or shallow memories, trees, devils etc. Klara loves to trigger the subconsciousness of the viewer. Therefore she uses lines and naïve drawings next to realistic painting. Something real and something that is merely thought or feeling, a combination referencing inner and outside worlds. Klara is currently enrolled in Fine Art Studies at the Academy of Fine Arts in Prague, Czech Republic. Caroline’s project called Manscapes explores the male body as an object to the female gaze and deals with intimacy, male beauty, fragility and materiality. Manscapes is seeded in her personal relationship to the naked male body and my fascination of its beauty combined with a wonder of the lack of female perspective on the male body throughout the history of art as well as in the contemporary art scene. Portraits of men are normally associated with an identity, action or history. The male body is connotated with the strong, the hard and the dry. Caroline depicts the anonymous, passive male body, the object. She focuses on the aesthetics and materiality of this object and the affective responses it creates when it meets other materials such as sheets, paper, cement or canvas. - How can I create artworks that reflects my female gaze on the male body while conveying the strange mixture of intimacy, affect, love, lust, power, and caring that the beauty, softness, sensuality and fragility of the male body evokes? - What kind of reactions does it create to depict a man in this manner and which taboos does it reflect on? Caroline Lives and works in Copenhagen, Denmark and Valparaiso, Chile. She earned a Masters Degree in Biology and Art History and has worked as a curator in the field of science related exhibitions. Her works have been exhibited in Denmark, Chile and China since 2007. Simone Zewnik arrived at sculpting by the way of photography. The topic of all her works is the human being. Simone’s sculptures are intended to show human beings both as individuals and interacting with others. The sculptures evoke age old concepts of artificially created human beings or "homunculi". The subject is being interpreted by the artist through non-naturalistically coarsely crafted figures which intentionally are tacked up with rough seams and are made of bare, prepared pig skin. Mankind's imagination has been caught by homunculi since ancient times, as exemplified by the Genesis. "We shudder at the figure of a breastfeeding mother. She arouses an ambivalent feeling, torn between symbolic vitality and the lack of vital signs. The figures fascinate and disturb, they spur the debate on human and animal existence; on life and death." Maria Frickenstein, Neue Westfälische, 20.9.2017. Simone lives and works in Harz close to Berlin, Germany and her works have been presented in international shows and galleries such as NordArt 2016/2018, Store Street Gallery, London, Nicholas Treadwell Gallery, Vienna and most recently with Yoko Ono in Paris.